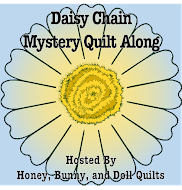 I'm excited that I actually managed to finish all 6 of this year's Project Quilting challenges! 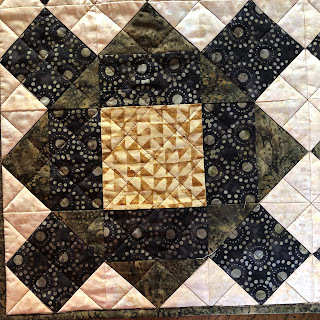 I got the cutting done early this week, but didn't have any time to work on my quilt until today, when my guild got together for a sew day. It was the perfect opportunity to get my sew on and finish up my project! 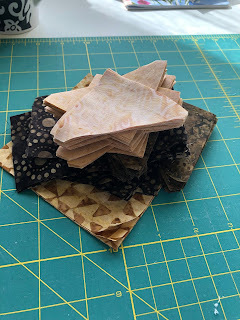 I started off with this little pile of pieces I cut using the Accuquilt GO! 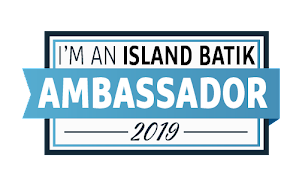 I received as an Island Batik Ambassador. 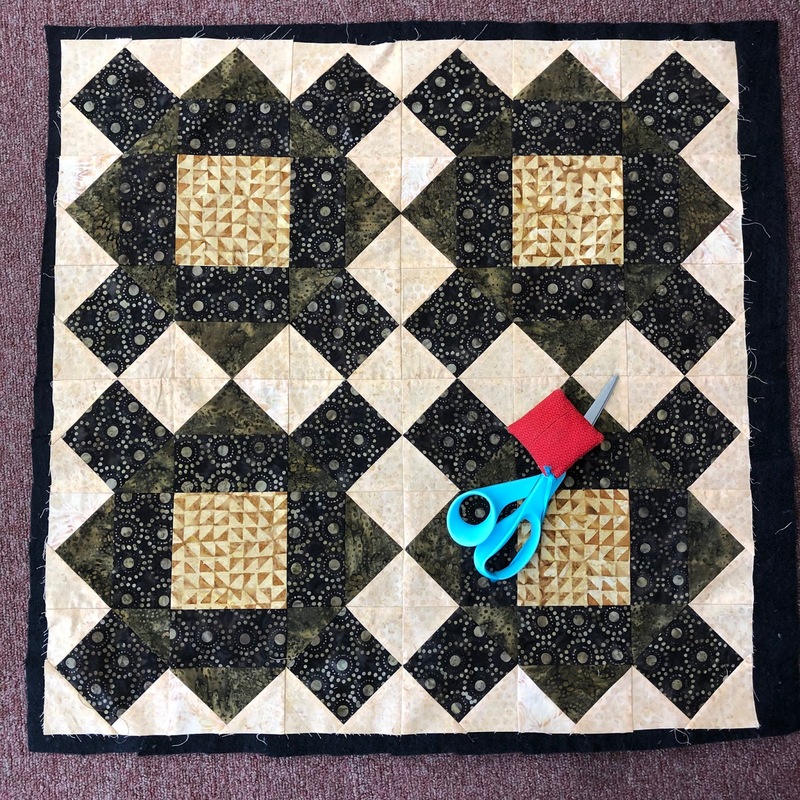 I wound a full bobbin of Aurifil 50 wt thread in dark brown to piece with, and got to work sewing square in a square and flying geese units. Once those were done, my four blocks came right together and were sewn into a top. After that, I layered my top with the backing and a piece of Hobb's Black cotton batting - awesome stuff! I've used poly batting in black, but this black cotton batting is really terrific! It's thin and light and has just the right amount of loft. You will definitely want to give this batting a try. 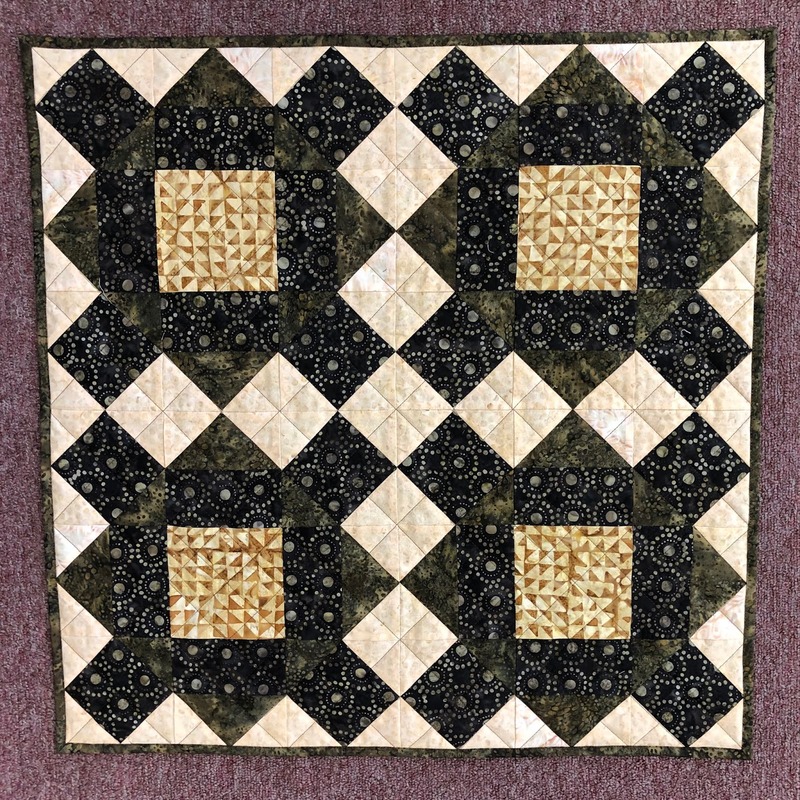 Then I just quilted this with diagonal lines, easy as pie! 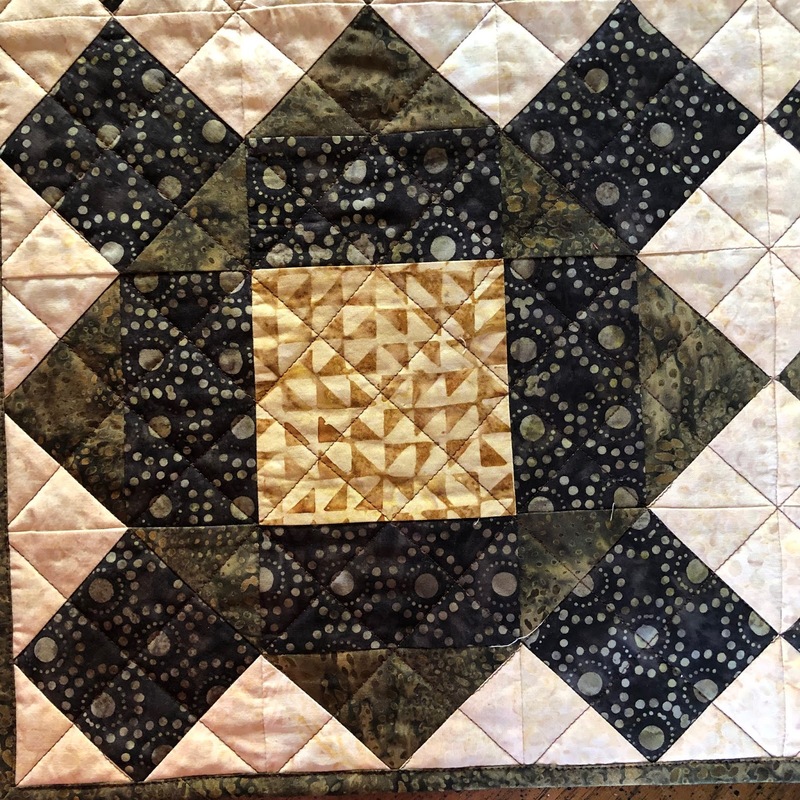 My friends were actually a little surprised at how quickly this quilt was finished. I'll tell you what was amazing to me - I only had to wind one bobbin! 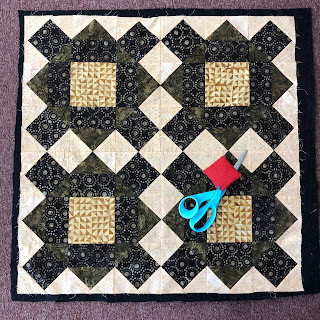 I pieced, quilted and stitched the binding all with one bobbin of thread, and had plenty to spare. Just one of the reasons I love Aurifil! 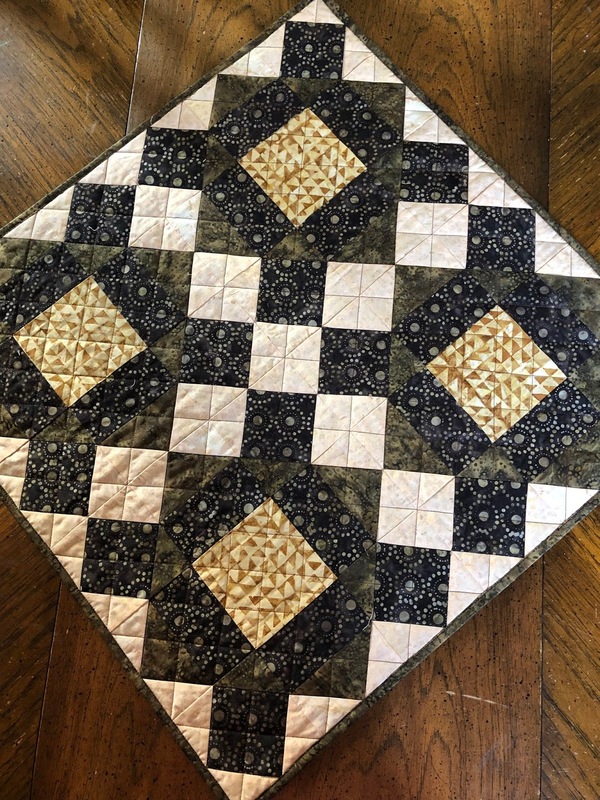 This quilt measures 24 x 24. 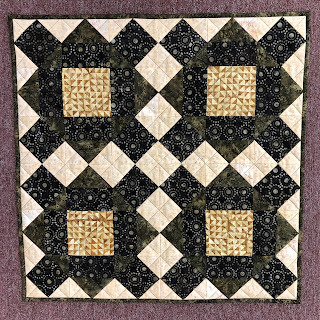 My inspiration is the color - plus this block is Chocolate Cake from EQ8. And chocolate was consumed during the process of making it! 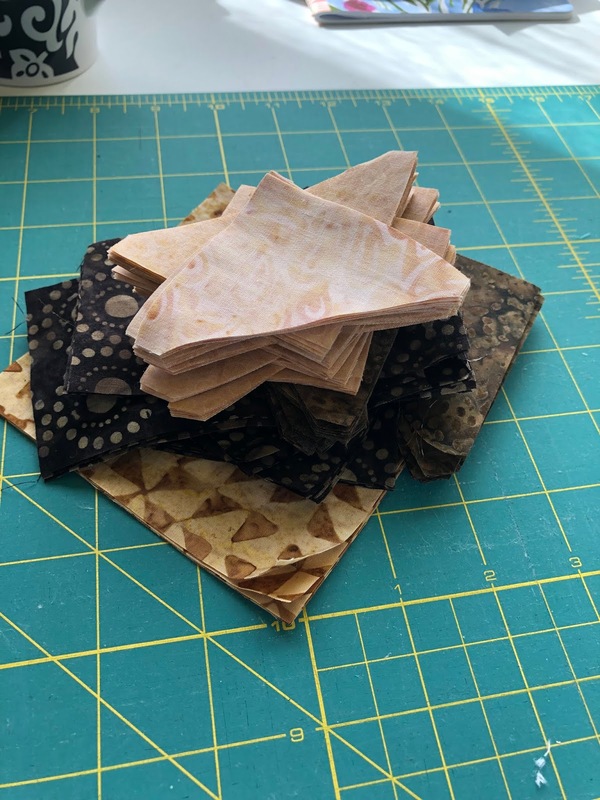 (Should have got a picture, but I forgot) Created in Coos Bay, Oregon in the company of my friends from Coos Sand 'N Sea quilters - it was fun ladies, can't wait until we can do it again! Thanks to Kim at Persimmon Dreams for the fun challenges this year! It's been a blast, and I appreciate all the work to make it happen. And the participants are amazing and creative - you should definitely check them all out! Who doesn't LOVE Chocolate Cake?!? SWEET entry. This is a wonderful little quilt! I like the printed fabrics you chose. this is wonderful! Love what you've done!